For many, New Year’s Eve is usually a busy affair: Parties, drunken stupors, kissing the wrong person, and having to get on a time machine to undo the damage. And since time travel is so expensive, I’d rather play it safe by staying home and watching a movie. The evening of December 31st, 2012 was no exception and, after putting my son down to sleep, my wife and I sat down with a plate of Gouda and crackers, a bottle of Moscato d’Asti, and the remote control for Netflix streaming. What did we get? A deceived husband who learns his wife is in love with another man. A Machiavellian plot to murder her. A police inspector who suspects foul play but can’t prove it. A simple premise… but in the hands of a master director, a film of top-notch, twisty suspense. 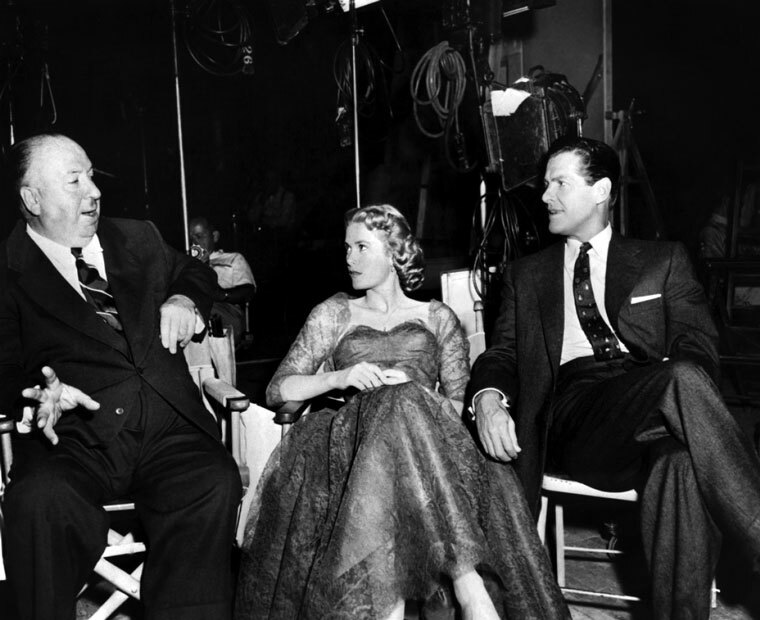 Director Alfred Hitchcock, Grace Kelly and Robert Cummings discuss a scene. Dial M for Murder sticks close to the theater production that inspired it: most of the action takes place in one set, the living room of a flat in London. Margot Wendice (Grace Kelly) has been two-timing her husband, Tony (Ray Milland), with crime-fiction writer Mark Halliday (Robert Cummings). As the movie starts, they discuss how best to tell Tony, effectively placing audience sympathy on the cuckolded husband. But it becomes apparent quite quickly that Tony is no innocent victim: not only does he know about the affair, he has devised “a perfect murder” that will take care of his unfaithful wife and put him in the clear. Tony explains his plan detail by detail to the would-be assassin, an old university buddy (Anthony Dawson) with a shady past. Hitchcock loves dialogue, and much like he did six years before in Rope (1948), he stages each conversation in a way where words become the catalyst for tension. At this point in the plot, Hitch had us in his grip. The sound of fireworks outside made us realize it was midnight, so we stopped the film briefly for the requisite kiss and hug. We quickly refilled our glasses and continued. Could Tony’s plan really be executed? Would he get caught? What if anything went wrong? As luck would have it, something does go wrong (the murder sequence is as iconic as anything Hitchcock has ever done, with a rightfully famous shot of an open pair of scissors). The film then veers into an even knottier puzzle where Tony must construct lie upon lie so he can remain above the suspicions of the authorities. To reveal more would be a crime (pun not intended). This is an absolute must for fans of Hitchcock and the crime thriller genre in general. The perfect New Year’s Eve. Cheers!